One of the very first products I developed and tested was Cleansing Grains. Having sensitive skin myself... finding a soothing, balancing, skin nourishing blend was my goal. skin balancing herbs, grains and clay. In preparing our products, we blend with organic ingredients as much as possible (crops and time of year tend to dictate availability and pricing). These Cleansing Grains can be combined with any cleanser, to create an exfoliating paste. Or with small amount of honey and yogurt to create a moisturising facial mask. 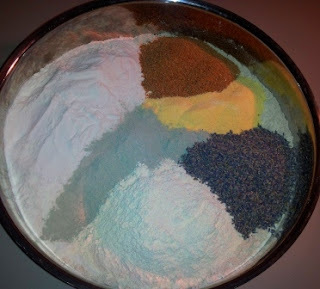 Here is a pic of the batch just put together, before it is ground into a finely milled product. All of these natural ingredients combine to create a gentle exfoliating scrub and or moisturising/toning facial mask that helps to unclog pores and revitalise the complexion. Just put on an Elvis CD! 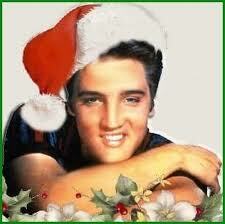 Not sure why, but the weeks before Christmas make me crave a little Elvis music (and the occasional Elvis movie). Blue Christmas & Don't Be Cruel, rocking the studio! !